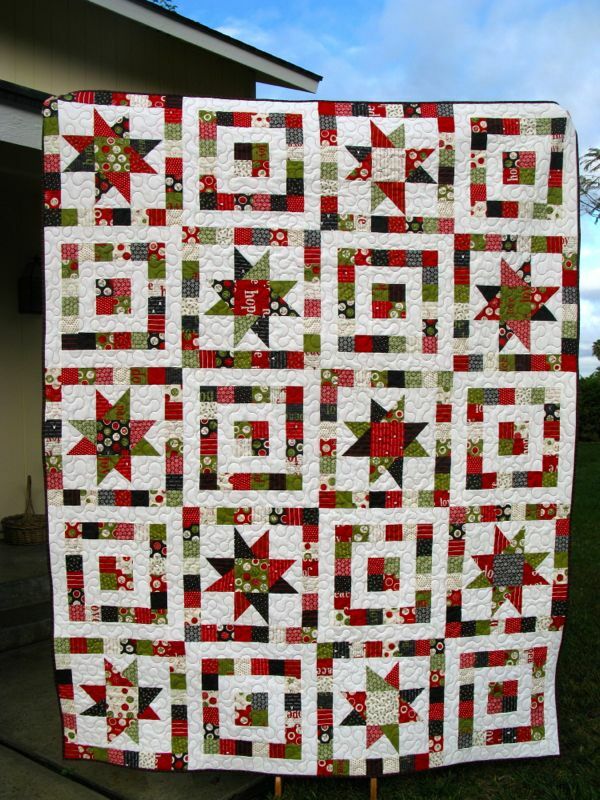 Star Mother’s Youngest Child quilt | OccasionalPiece--Quilt! 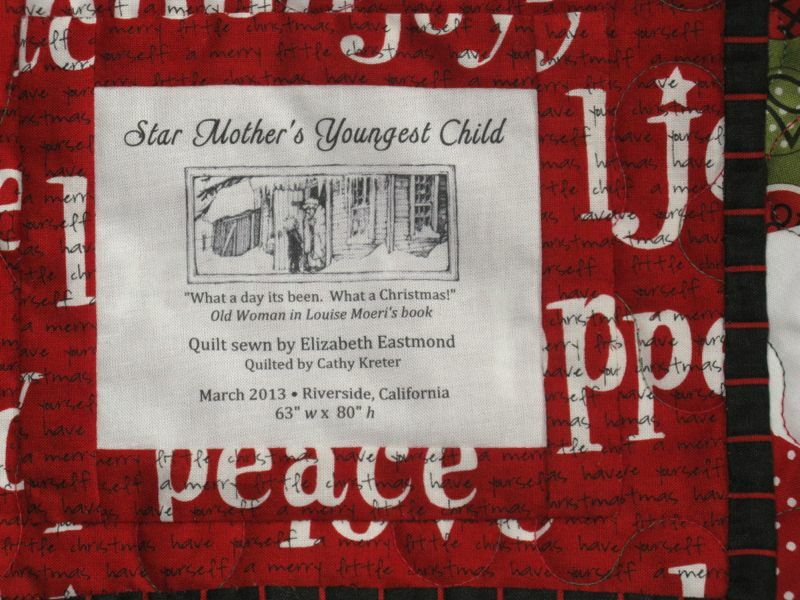 Posted on March 8, 2013 by Elizabeth E.
Here’s my second finish for March: Star Mother’s Youngest Child. 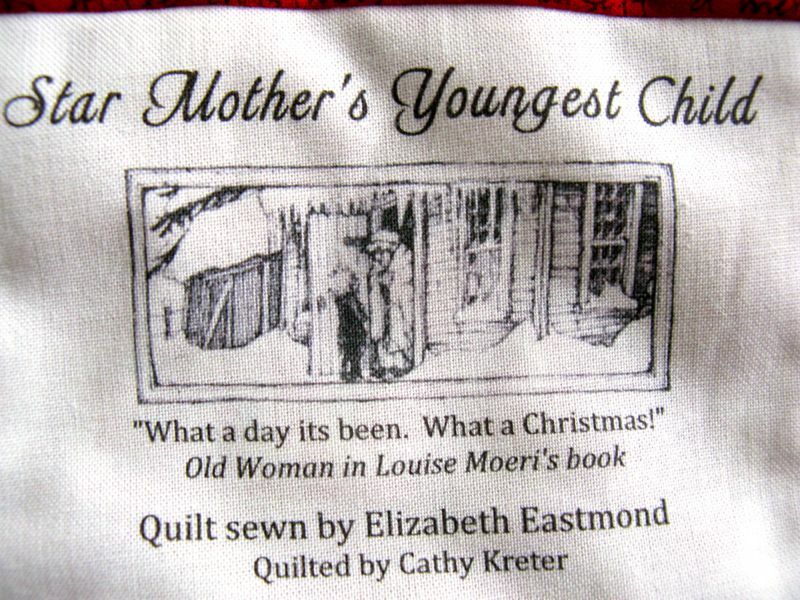 The book, from which the title of this quilt is taken, was about Star Mother’s youngest boy who came to earth to experience Christmas before he was destined to take his place in the heavens, shining brightly forever. He landed at the home of a cranky old woman, who, childless and alone, just wanted to have one Christmas to celebrate before she died. And so the two came together. The illustrations are charming, and the child’s spikey hair and ugly countenance reminded me of the weirdo star in the bottom left corner, the points going the wrong way even though I tried really hard to get them like the picture of this quilt from the Moda Bake shop pattern. But in the aggregate, I think it all works okay. Whenever I’m looking for a back, I usually go for whatever cheap fabric I’ve picked up on sale, or snagged from IKEA or the Marimekko from the Crate & Barrel outlet. I went to the guest bedroom closet, where these lengths all hang, washed, pressed and waiting and lo-and-behold! 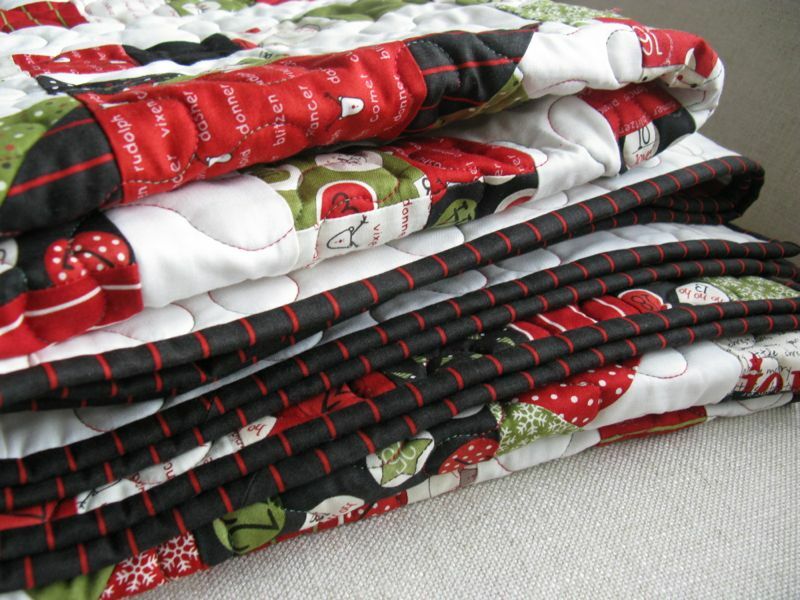 I’d purchased some of this Sweetwater Christmas line when I was buying the rest of the fabrics for this quilt. It had been two years and so I’d forgotten. I pieced it carefully to make the seam as invisible as I could. I’ve tried doing pieced backs. I usually fail at that sort of thing because at that point, I’m just so ready to be DONE. I had also purchased this black/red stripe for the binding and even if it was on the original, I just didn’t know if it would work for my sensibilities. When I went to quilt night last week, Laurel told me it was just perfect. Sometimes you just need that atta’boy to help get these quilts done. I hand-stitched the binding while 1) watching a movie, 2) attending a baby shower another night, and then 3) coming home and talking to my husband after a long day. 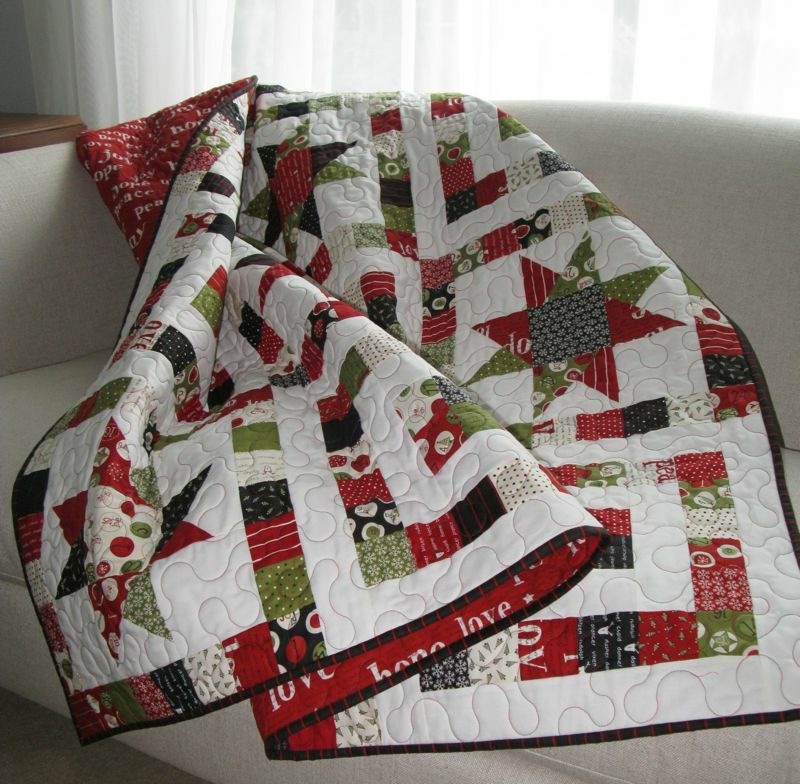 My quilter used Superior’s King Tut in a tight red/green variegated color in a medium meander. For the label, I scanned a picture from the book when the little child first knocks on the Old Woman’s door, and included a quote from the last pages of the book. 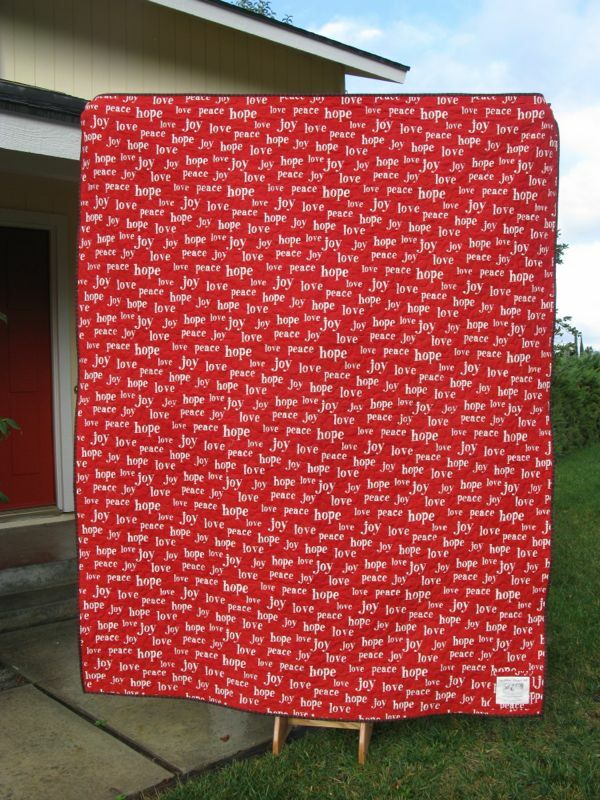 This is #108 on my list of 200 quilts. Frankly, I can’t keep up this pace of finishes unless I stop sleeping or eating (neither of which is very likely). The last two quilts have been in the pipeline for a couple of years, and I just had some extra time this semester and was able to get them finished (along with the help of my quilter). But for today, it’s nice to see this all done, lounging on my sofa. 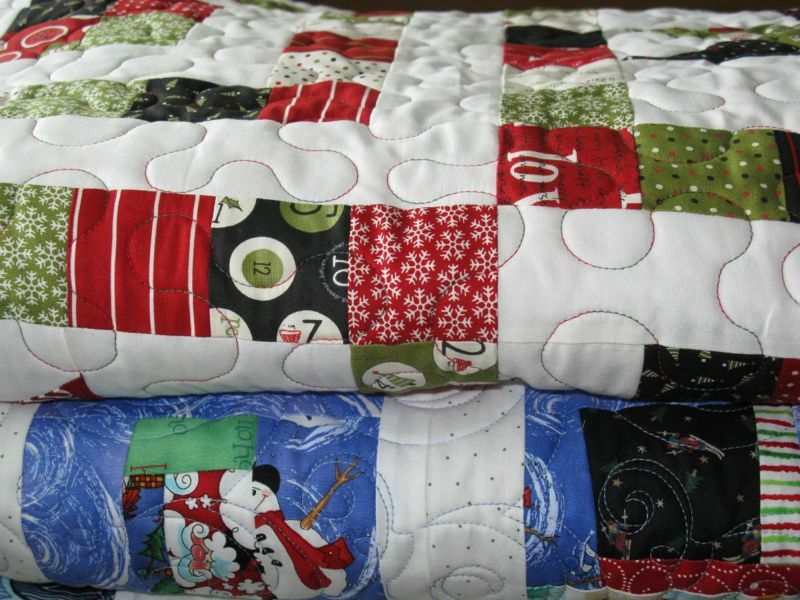 That makes five Christmas quilts I’ve done in my lifetime: two have been given away, and the other three reside here. It will be fun to get those out this coming December. Stop! You are making me feel like a big slug. I barely have any starts, let alone finishes!! Love the label. I would never have thought to use black in the binding, but I quite like the finished look. I love the creative name and label too. Just four more quilts to go this month, right? 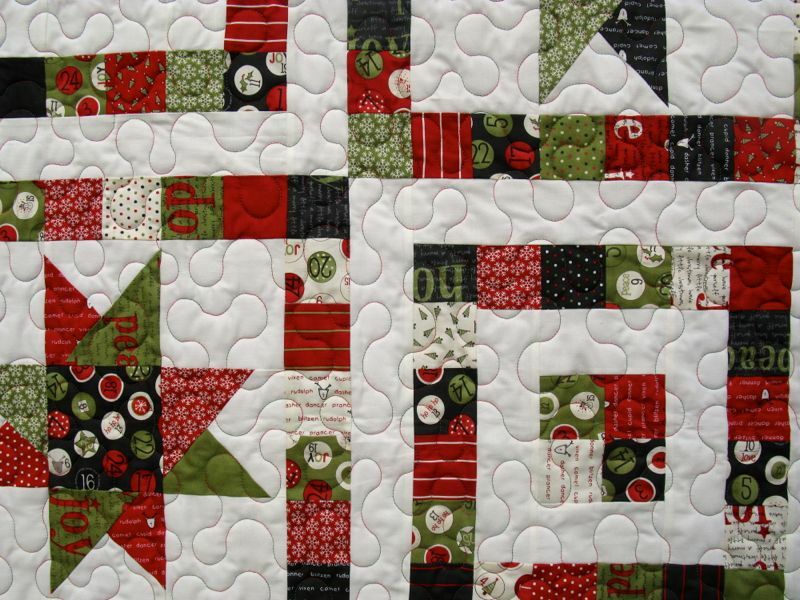 I am really liking these borderless quilts. Star Mother’s Youngest Child is beautiful. Sorry, I meant the previous post to be a comment, not a reply, but I clicked the wrong thing. I can see I ‘tuned in” while you are on a whirlwind! I like starting better than the middle, but then I love finishing…and I love both the quilt and the story. (In a former life I taught English composition too, and sometimes literature. I agree, grammar was important, but only a portion of the important things…Thanks for visiting my blog.